Once the frequency relation is formulated in terms of ω, the angular frequency, the problem can be solved with 3 distinct solutions. These three solutions correspond to the equatorially trapped gravity wave, the equatorially trapped Rossby wave and the mixed Rossby-gravity wave (which has some of the characteristics of the former two) . Equatorial gravity waves can be either westward- or eastward-propagating, and correspond to n=1 (same as for the equatorially trapped Rossby wave) on a dispersion relation diagram ("w-k" diagram). At n = 0 on a dispersion relation diagram, the mixed Rossby-gravity waves can be found where for large, positive zonal wave numbers (+k), the solution behaves like a gravity wave; but for large, negative zonal wave numbers (−k), the solution appears to be a Rossby wave (hence the term Rossby-gravity waves). As mentioned earlier, the group velocity (or energy packet/dispersion) is always directed toward the east with a maximum for short waves (gravity waves). As previously stated, the mixed Rossby-gravity waves are equatorially trapped waves unless the buoyancy frequency remains constant, introducing an additional vertical wave number to complement the zonal wave number and angular frequency. If this Brunt–Vaisala frequency does not change, then these waves become vertically propagating solutions. On a typical "m,k" dispersion diagram, the group velocity (energy) would be directed at right angles to the n = 0 (mixed Rossby-gravity waves) and n = 1 (gravity or Rossby waves) curves and would increase in the direction of increasing angular frequency. Typical group velocities for each component are the following: 1 cm/s for gravity waves and 2 mm/s for planetary (Rossby) waves. These vertically propagating mixed Rossby-gravity waves were first observed in the stratosphere as westward-propagating mixed waves by M. Yanai. They had the following characteristics: 4–5 days, horizontal wavenumbers of 4 (four waves circling the earth, corresponding to wavelengths of 10,000 km), vertical wavelengths of 4–8 km, and upward group velocity. 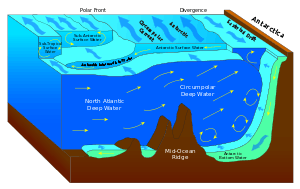 Similarly, westward-propagating mixed waves were also found in the Atlantic Ocean by Weisberg et al. (1979) with periods of 31 days, horizontal wavelengths of 1200 km, vertical wavelengths of 1 km, and downward group velocity. Also, the vertically propagating gravity wave component was found in the stratosphere with periods of 35 hours, horizontal wavelengths of 2400 km, and vertical wavelengths of 5 km. 1 2 3 4 5 6 7 8 9 Gill, Adrian E., 1982: Atmosphere-Ocean Dynamics, International Geophysics Series, Volume 30, Academic Press, 662 pp. 1 2 3 Zhang, Dalin, 2008: Personal Communication, “Waves in Rotating, Homogeneous Fluids,” University of Maryland, College Park. 1 2 Holton, James R., 2004: An Introduction to Dynamic Meteorology. Elsevier Academic Press, Burlington, MA, pp. 394–400. ↑ Yanai, M. and T. Maruyama, 1966: Stratospheric wave disturbances propagating over the equatorial pacific. J. Met. Soc. Japan, 44, 291–194. This article is issued from Wikipedia - version of the 2/10/2015. The text is available under the Creative Commons Attribution/Share Alike but additional terms may apply for the media files.